VANCOUVER, BC, June 14, 2012. Mirasol Resources Ltd. (TSX-V: MRZ, Frankfurt: M8R) is pleased to announce it has completed a 2,600 metre diamond drill program at the Rio Seco gold-silver vein prospect, part of the 100% held Claudia project located adjacent to the world class Cerro Vanguardia gold mine operated by Anglogold Ashanti and Fomicruz S.A., in Santa Cruz Province, southern Argentina. Mirasol recently reported it has initiated an aggressive surface exploration program focused on three large epithermal gold-silver prospects at the Claudia Project (Figure 1): the Rio Seco, Curahue and Laguna Blanca-Ailen prospects. Details of key exploration targets are described in news releases dated March 5, 2012 and April 18, 2012. At the Rio Seco prospect, exploration has outlined five vein zones exposed intermittently ¬over a 3,200 metre by 2,350 metre area, where surface geology and IP (induced polarization) electrical geophysics has defined a series of priority drill targets. Better surface assay results for Rio Seco come from the J Zone (Figure 1), and include up to 20.1 grams per tonne (g/t) gold and 34 g/t silver from rock chip sampling, and saw-cut channel and trench intersections of 0.7 metre at 13.9 g/t gold and 229 g/t silver, and 10.5 metres of 1.9 g/t gold and 22 g/t silver. A number of other gold silver anomalous vein showings and targets have been identified through sampling, trenching and geophysical results at the Loma Alta, Loma Larga, Oculto, Veinte and Rio Seco Main zones. Many of the Rio Seco vein showings host geological features such as preserved sinters, silicified lake sediments and lower temperature vein textures, which indicate the current outcrop level is near the top of a mineralized epithermal precious metal system. This suggests that wider veins and higher grade mineralization than seen at surface could be encountered at depth by drilling. 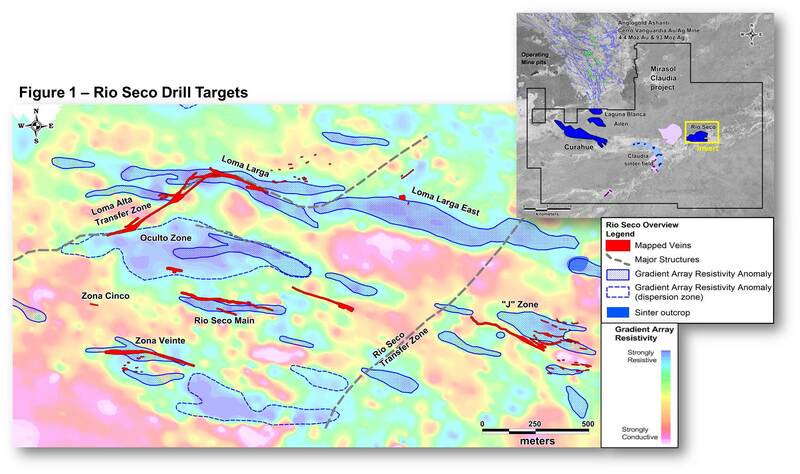 The current drill program will focus exclusively on the Rio Seco prospect, where a first pass core drilling program has been designed to test the veins at a range of depths from 25 to 130 metres below surface to identify trends of increasing gold / silver grades and wider zones of veining at depth. Drill results for the current drill test of Rio Seco will be reported as they come to hand over the northern hemisphere summer. In the western part of the property, surface exploration is ongoing at the Curahue and Laguna Blanca-Ailen prospects, with the goal of delivering a series of targets for sequential drill testing during the 2012-2013 field season (see news release April 18, 2012). Stephen C. Nano, Vice President of Exploration for Mirasol, is the Qualified Person under N.I. 43-101 who has verified and approved the technical content of this news release. Exploration at the Claudia Project is supervised by Stephen C. Nano, Vice President of Exploration, who is the Qualified Person under NI 43-101, and Timothy Heenan, Exploration Manager. All technical information for the Company’s projects is obtained and reported under a formal quality assurance and quality control (QA/QC) program. Drill core, rock chip and stream sediment samples are collected under the supervision of Company geologists in accordance with standard industry practice. Samples are dispatched via commercial transport to an ISO 9001:2000-accredited laboratory in Mendoza, Argentina for analysis. Results are routinely examined by an independent geochemist to ensure laboratory performance meets required standards. Assay results from diamond drill core or RC drill samples may be higher, lower, or similar to results obtained from surface samples.